By example, he called his senior FFA members to the front during the 69th annual “Stars Over Delphos” FFA Parent and Member banquet Sunday at Jefferson High School. Kelly Krites, Michelle Rode, Eli Lucas, Emily Buettner, Maggie Ream, Colin White and Trevor German rose to the occasion. Jefferson High School Principal Chad Brinkman also spoke. 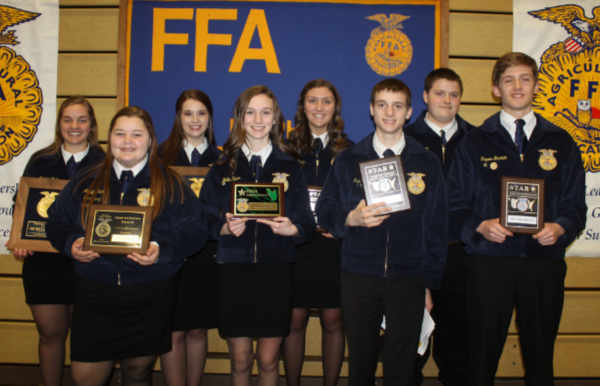 Local awards given included: Agriscience — Kenzi Coffey, Hannah Dickson, Halle Elwer, Landon Elwer, Aly Lindeman, Austin Pohlman, Cody Redmon, Austin Ricker, Kendall Schrader and Garrett Mueller; SAE Discovery — Cassidy Beining, Olivia Martin, Nathan Gable, Avery Schulte and Tyra Moyar; Ag Service Placement — Trevor German; Ag. Sales Placement — Hannah Elwer; Specialty Crop Production Placement — Isaac Gable; Poultry Production Entrepreneurship — Braxton Scalf; Sheep Production Entrepreneurship — Carson Kazee; Small Animal Care Entrepreneurship — Kelly Krites; Turf Grass Management Entrepreneurship — Troy Elwer; Highest GPA Scholarship — Michelle Rode; Freshman Record Book/AET — Troy Calvelage and Caden Meyer; Sophomore Record Book/AET — Brianna Altenburger and Jeffrey Odenweller; Junior Record Book/AET — Anna May and Mark Wrasman; and Senior Record Book/AET — Michelle Rode and Emily Buettner. This is the first time ever Elwer has awarded two Dekalb Awards. 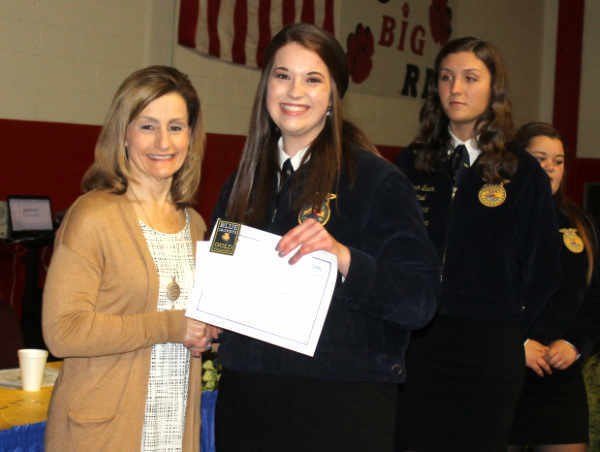 Shelly Schulte also presented four scholarship from the FFA Booster Club. Those were received by Eli Lucas, Michelle Rode, Trevor German and Colin White. Other accomplishments included Troy Elwer as a state finalist in Turf Grass Management Entrepreneurship. Elwer also earned his American Degree. Hannah Elwer, Anna May and Mark Wrasman earned their State Degrees and Ethan Bonifas, Cole Reindel, Cody Wright and Brandon Wrasman also earned their American Degrees. There are 87 FFA members this year from three schools, including Jefferson, St. John’s and Fort Jennings. There are also home-schooled members. The 14th annual Delphos FFA Member Auction will be held at 7:30 p.m. on April 10 in the Jefferson High School cafeteria. FFA members can be purchased for eight hours of labor in a live-auction format. A light meal will be provided to bidders at 7:15 p.m. RSVP to the Ag Department at 419-695-1786, ext. 407.